There is good news for spouses and children (unmarried and under the age of 21) of lawful permanent residents, aka F2A category, this month! Starting August 1, 2013 through at least August 31, 2013, the F2A category has a current priority date for nationals all over the world. This means that all foreign nationals who are the spouse or child (unmarried and under the age of 21) of a green card holder may apply for lawful permanent resident status immediately. If the spouse or child of the permanent resident is currently in the U.S., the permanent resident should file the I-130 and I-485 as soon as possible. If the I-130 has already been submitted and is either pending or approved, the permanent resident should go ahead and file the I-485 during the month of August. If the spouse or child of the permanent resident is outside of the U.S., the permanent resident should file the I-130 as soon as possible. If the I-130 has already been submitted and it is approved before or in August, the permanent resident should go ahead and initiate consular processing in their home country’s U.S. Consulate during the month of August. So whether you already have a petition filed under the F2A category or whether you do not yet have a visa petition filed for you and are the spouse or child of a permanent resident, you should act as soon as possible to take advantage of the F2A category’s current priority date. We are not sure if the F2A category will remain current beyond the month of August, so do not miss this opportunity. Click here for more information on petitioning for a family member. How does CIR affect Black Immigrants? 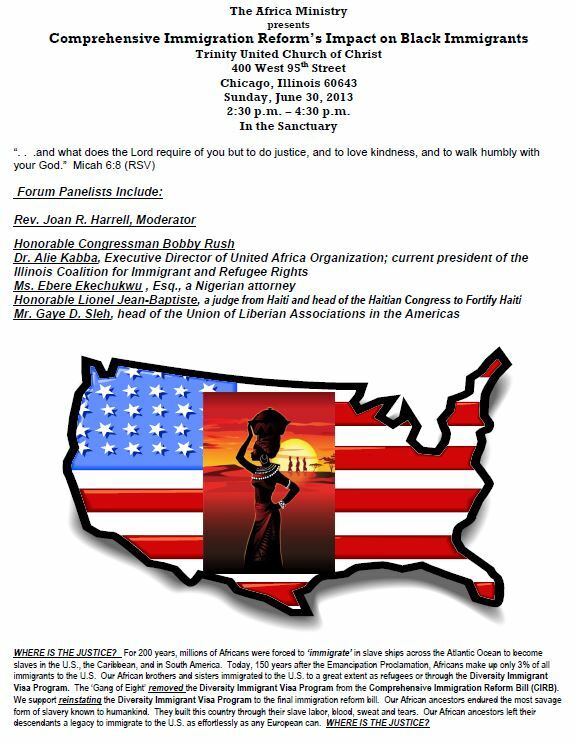 The African Ministry of Trinity United Church of Christ will be hosting a panel discussion this Sunday to discuss how comprehensive immigration reform impacts Black immigrants. Will you have your voice heard? African Voices is back with episode 19! African Voices Podcast offers the African community in Illinois the opportunity to have their voices heard. In addition to upcoming events and local and global news relevant to the African community, we feature key findings from our African Cabdriver Health Survey and advice on accessing healthcare. If you would like to contribute news stories, events, issues, interviews or music to our podcast, email us at: podcast@uniteafricans.org or call 312-949-9980. Support our work by making a donation today! June 3rd marked the 125th anniversary of Martyrs Day in commemoration of the 22 Uganda Catholic Martyrs who were murdered in 1886. In Uganda, the day was a culmination of several days of trekking, sacrifice, prayer and meditation by pilgrims to the Catholic shrine that was built at the spot where St. Charles Kalooli Lwanga was burnt. In Chicago, the Ugandan community is marking this day with a special event on June 8th at St Hubert Catholic Church, 729 Grand Canyon Street, Hoffman Estates, IL 60169. The Uganda Martyrs were Christian converts who were murdered for their faith in the historical kingdom of Buganda, now part of Uganda. The main reasons for their murder were refusal to offer sacrifices to the traditional gods and objection to and resistance to King Mwanga’s homosexual practices. Their killings seem to have been tied to specific resistance to Mwanga’s attempts to engage in homosexual practices with those killed immediately before the killings. Saint Charles (Carl) Lwanga and his companions, Martyrs of Uganda, were a group of Christians (both Roman Catholics and Anglicans) who were murdered by Mwanga II, the Kabaka (King) of Buganda, between 1885 and 1887. These deaths were part of a three-way religious struggle for political control of the Buganda royal court. In 1877, the Church Missionary Society in London had sent Protestant missionaries to the court, followed two years later by the French Catholic White Fathers. These two competed with each other and the Zanzibar-based Muslim traders for converts and influence. By the mid-1880s, many members of the Buganda court had converted and become proxies for the religious and nationalist conflict being played out in the court. Kabaka Mwanga II, upon his ascent to the throne, attempted to destroy the foreign influences he felt threatened the Buganda state, but was instead deposed by armed converts in 1888. Anglican James Hannington, the Protomartyr, had been dispatched to be the bishop of Eastern Equatorial Africa, but he was executed with his companions before they could enter Buganda. 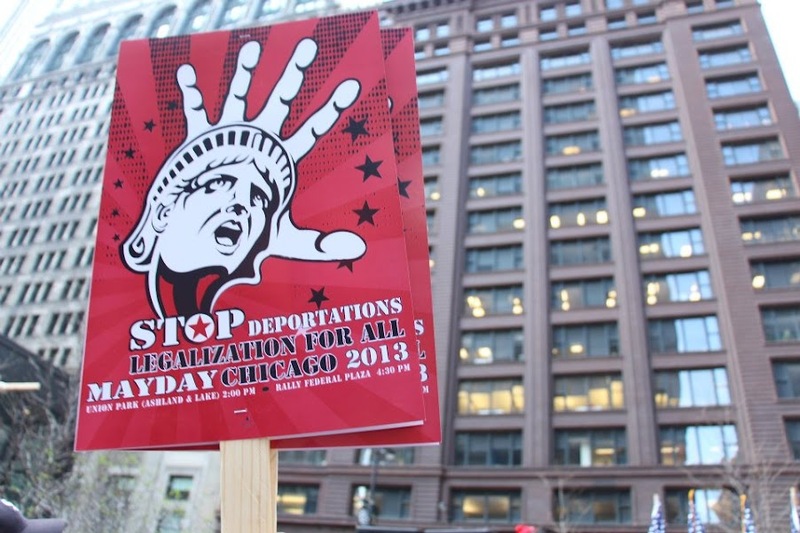 The Chicago City Council adopted a resolution on Wednesday, May 8, 2013 in support of UAO’s advocacy to include Diversity Visa Program in the proposed comprehensive immigration reform bill. The diversity visa program is one of the few options available for Africans to come to the US as immigrants. Eliminating the program will have a negative impact on the future flow of black immigration. In this historic moment, we would like to thank Alderman Will Burns (4th ward) for his tireless effort to have this resolution adopted in the City of Chicago. Click here to view the Resolution! African leaders assemble at City Hall today to celebrate a resolution that promotes diversity visas and an inclusive immigration reform bill. Pictured: Rosemarie Tamba (UAO), Congressman Bobby Rush (D-IL-1), Alie Kabba (UAO), Ngozi Nmezi (Washington DC), Bakary Tandia (New York). On Saturday, May 18th, United African Organization hosted its 7th Annual Chicago African Summit & Resource Fair at the Northeastern Illinois University’s Carruther’s Center for Inner City Studies. At the Summit, attendees had the opportunity to reflect on critical issues that affect the African community. Panel discussions on comprehensive immigration reform, accessing healthcare through the Affordable Care Act, and organizing African immigrants and refugees on the local and national level informed the community on how these policies affect them and the importance of advocacy work to fight African issues. Congressman Bobby Rush (D-IL-1) gave the keynote speech, further motivating the crowd to be advocates for change in regards to African issues. We would like to thank all of our panelists for providing thought-provoking information and stimulating conversation throughout the day, as well as all of our interns and volunteers for making this event a success. A special thanks to the organizations that participated in the Resource Fair providing health, immigration, legal, and employment services to the community. PHOTO REEL: May Day 2013! 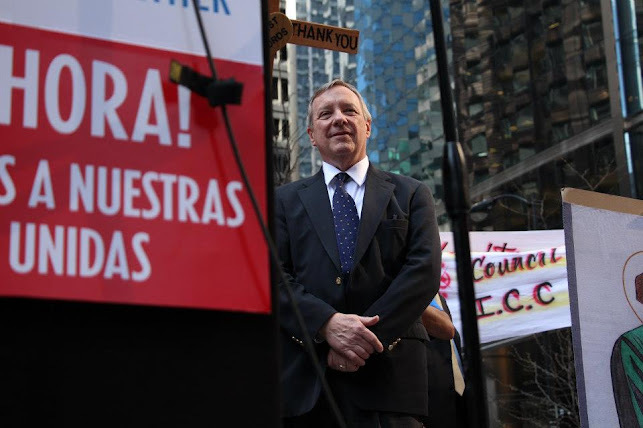 On May 1, 2013 UAO and allies rallied together to demand legalization for all undocumented immigrants under the Gang of 8′s proposed immigration reform bill. 7th Annual Chicago African Summit & Resource Fair! The Chicago Summit on African Immigrants & Refugees is the premier forum of its kind in the Midwest with a special focus on contemporary African issues, public policy advocacy and community empowerment. This FREE forum brings together scholars, legislators, community activists, policy analysts and students, and individuals like you, to engage in constructive dialogue about Africa and the Diaspora. 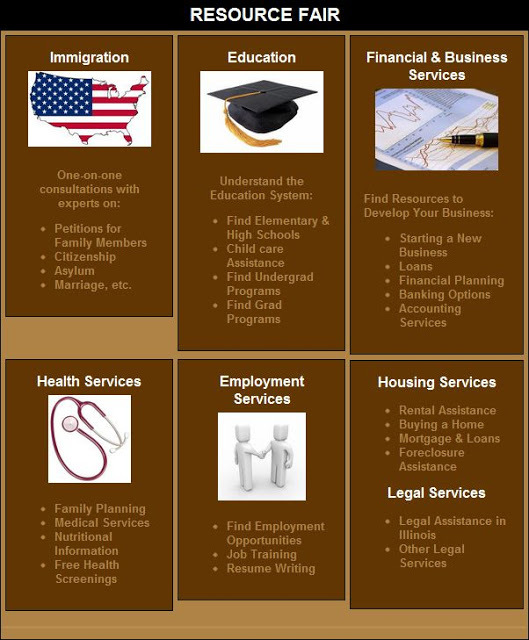 The Resource Fair offers information and resources on Immigration, Legal Assistance, Employment, Housing, Health, Education, Business, and many more.